We have also included a VS 2017 project with all the examples inside. Once we build the engine core we will upload it to the GitHub branch. In the meanwhile, you can download the Urho3D example project and start playing with the Urho3D game engine. Last Edit: 1 year 3 months ago by cyberix3d. Hey everyone, I would also like to tell everyone about my Cyberix3D Github branch, you can look at the Github Formating Syntax so you can help with the Github project but it is not completely finished, I am glad to help you Cyberix3D, also I am planning on modeling a few pre made assets to come with the new engine. We have updated the Github and added a new project - Cyberix3D Engine. The project contains a list of features and a to-do list. Evry to-do contains checkboxes with the to-do's subtasks. You can break a task to more subtasks by adding -[ ] under each subtask. You can ask questions on this forum regarding the to-do list we have added. 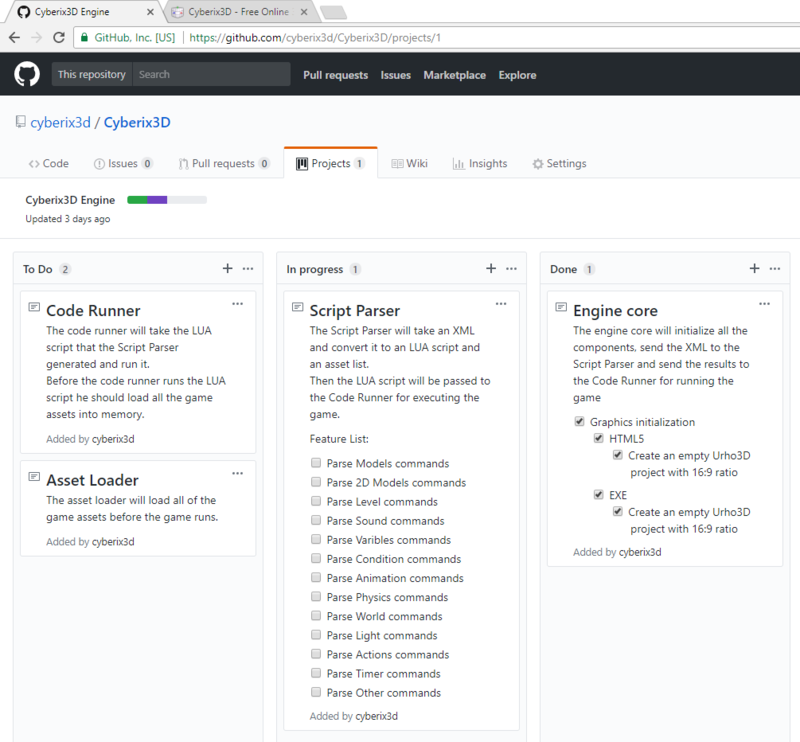 You can also write any information regarding the design of the Cyberix3D Engine in the GitHub Wiki or the Cyberix3D Wiki. You are welcome to enter the project and start contributing to the effort of making the new Cyberix3D Engine. Hello, we aren't able to edit them, are we supposed to fork these? Our first task is to initialize the Urho 3D engine in html5 and exe. We have succeeded to make a simple program in exe but we are having troubles to make a simple program in html5 (targeting emscripten). As soon as we will make the graphics engine initialization in html5 and exe we will upload the code to the github brunch and then everyone could fork it and add code according to the task in the github project. We would need the help of the community in the future to make it happen. We have managed to complete the first task of the graphics initialization for exe and html5. Now we will focus on the next task of converting a Cyberix3D XML script into LUA script and then run the LUA script with the Urho3D engine. Last Edit: 1 year 2 months ago by cyberix3d. Oh cool! This is great, just three more to go. Hello Cyberix3D, is there anymore updates coming? I really am interested in your new engine. The Github project is being delayed but eventually, we will progress it when we have the time. In the meanwhile, we have decided to focus on converting the Cyberix3D editor to Windows desktop application. When the desktop application will be available, opening a game from the site will open the game in the desktop app, and every game that will be published on the desktop app will be shown in the site. First, We will make an online version of the desktop app, so internet connection will be required, and then we are planning to add an offline version. Wow, a Windows Desktop Application. I can't wait! Hello again Cyberix, I have a few questions on the new engine. 1) Will the quality in graphics improve up to the levels of Unity 3D or Unreal Engine 4? 2) Will this new engine be easier to use? 3) Will the UI/Layout be more modern and perhaps customizable to the developer's needs? 4) Will the engine include faster loading speeds and great framerate and such? 5) Will the new engine be an program exe you can run on your computer? in browser engine? 1) the graphics quality of the new cyberix, I believe that they will be inherited by a graphics engine called urho3d, and I have seen many videos about the graphics of this engine and they are surprising, so the quality of the graphics can be at unity level. Last Edit: 4 months 2 weeks ago by GODEBEX.